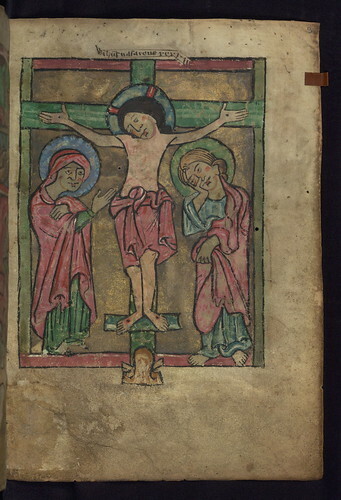 Psalter of St. Mary of Strasbourg, Crucifixion, Walters Manuscript W.69, fol. 3r, originally uploaded by Walters Art Museum Illuminated Manuscripts. This Latin Psalter was made in the second half of the thirteenth century for use in the Diocese of Constance, Germany. By the fourteenth century, it was owned by the church of St. Mary of Strasbourg, from which it gets its name. The long life and enthusiastic use of the manuscript is attested to by a multitude of added inscriptions, prayers, and antiphons with neumes, most dating to the fifteenth or sixteenth centuries. An early system of bookmarking is also evident here, for strips of parchment have been cut in some of the margins and folded through a slit in the page, creating tabs that would have helped the reader navigate through the text. Illumination also served this function, for while a short cycle of images from the life of Christ introduces the manuscript, the rest of the illumination, large decorated initials as well as smaller ones in silver and gold, marked the important psalms for the reader. The style of illumination found here is closely related to two other Psalters from Constance: Sigmaringen, Royal State Archives Ms. 11, and Fulda, Hessische Landesbibliothek Fulda, Ms. Aa 82.